Recommended Climate: Colombia / Venezuela / Panama. 25-27°C (day), 20-22°C (night). 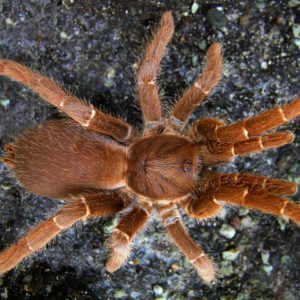 Basic Enclosure Requirements: Terrestrial setup with at least 4 x the size of the spider in horizontal space, 5cm to 10cm of substrate with a shelter and a water dish. 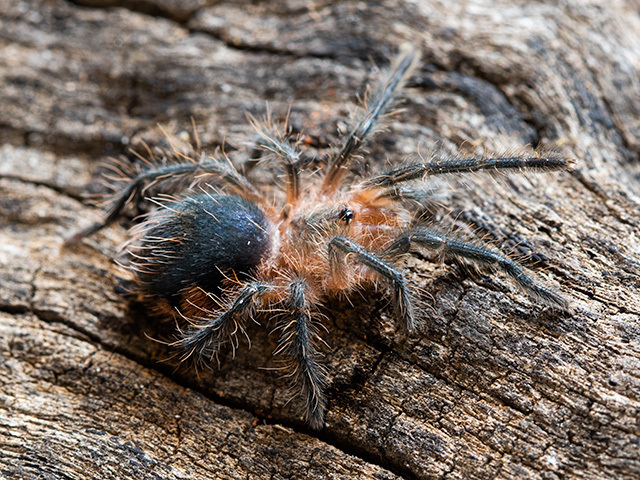 Bred recently for the first time in South Africa, this is not a spider you see on the market every day and we think there is always going to be a demand for Pamphobeteus species down the road because of their similarity to the “Goliaths”. The Colombian Giant Brown / Copperhead as the name suggests, is mostly brown (Like all the Pamphobeteus species) but this is not entirely accurate as there are also light hues of purple visible here and there as well as the light copper tones that are seen all over the carapace, thus why we prefer to call it the Giant Copperhead. As with most Pamphobeteus species, colors are much more pronounced on mature males. From young however, slings and juveniles possess the black zig-zag-like christmas tree pattern on their abdomen and their carapace turns to a warm copper color when slings reach 3cm to 4cm in size already. At full size, it’s a very impressive spider and a rewarding tarantula to keep, quite happy to sit out in the open for all to see, they make a good display tarantula. They’re a little skittish and defensive as youngsters, raising their abdomen/opisthosoma up in the air to look bigger and more threatening as a defense, they will also flick urticating bristles in your direction if they feel threatened so take care because they have some of the most irritating bristles in the business. However, they mellow with age and become large slow-moving monsters, until disturbed that is… they can suddenly move with unexpected speed. Although pretty laid back for it’s size, this spider is bold and will gladly stand it’s ground if it’s in the mood. Its will eventually get defensive and flick urticating bristles or even throw a threat pose if annoyed enough. As always, get to know your specific tarantula.